Home/Investigators and Research Centers/Investigators/Elpida Fragouli, MSc,Ph.D. Dr. Elpida Fragouli, MSc, PhD, FRSB, FIBMS is the Research Laboratory Director of Oxford Basic Research Centre. Dr. Fragouli obtained her Bachelor of Science in Molecular Biology from the University of Surrey, and a Masters of Science in Biochemistry (Genetic Manipulation and Molecular Biology) from the University of Sussex. She went on to obtain a second Masters of Science in Prenatal Genetics and Fetal Medicine from University College London, followed by a PhD in Human Genetics, also from University College London (UCL). During and after her PhD studies, Dr. Fragouli developed and performed multiple clinical cases for the preimplantation genetic diagnosis (PGD) of various different types of structural chromosome abnormalities, such as reciprocal and Robertsonian translocations, inversions, at the UCL Centre for PGD. She also designed, optimised and validated one of the first strategies for preimplantation genetic testing for aneuploidy (PGT-A). This strategy was clinically employed for the purposes of PGT-A at the UCL Centre for PGD. 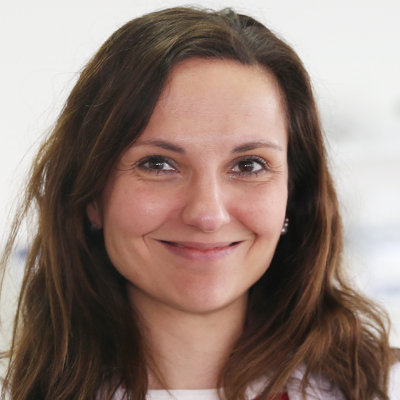 Dr. Fragouli remained in UCL’s Department of Obstetrics and Gynaecology for 2 years after completion of her PhD studies, to carry out a research fellowship which involved a detailed investigation into the cytogenetics of human oocytes, focusing on identifying different aneuploidy mechanisms, developing novel ways of comprehensive chromosome assessment via the use of Comparative Genomic Hybridisation (CGH), as well as carrying out a transcriptomic analysis of chromosomally normal and abnormal oocytes. She was also involved in teaching in UCL’s MSc course in Prenatal Genetics and Fetal Medicine. After completion of the UCL research fellowship, Dr. Fragouli took a research position at Yale University’s Department of Obstetrics and Gynecology. Her research at Yale involved the investigation of the cumulus cell transcriptome, in an attempt to determine the influence of the follicular environment to the generation of female aneuploidy. While at Yale, she was the first to optimise and clinically apply CGH for the comprehensive chromosome analysis of embryos at the blastocyst stage of preimplantation development for the purposes of PGT-A and PGD. In 2007, Dr. Fragouli returned to the UK, and became the Laboratory Director of Repogenetics UK as well as holding a research position at the University of Oxford. During her time at Reprogenetics UK she oversaw and directed a large team of PGD specialist scientists, and was involved in the organisation of a very successful clinical service for the PGD of chromosome and single gene disorders, as well as for numerical chromosome abnormalities (PGT-A). While at Reprogenetics UK, Dr. Fragouli was responsible and led several research projects focused on the better understanding of the genesis of aneuploidy in gametes and embryos, and the identification of novel biomarkers of embryo competence. Dr. Fragouli played a key role in the development, validation, and clinical application of CGH, the first comprehensive chromosome analysis method to be widely applied for the study of human embryos in both clinical and research settings. The proliferation of chromosome screening techniques seen during the last few years owes much to her early work in this area. Of particular note are her studies that highlighted the blastocyst as the optimal embryo stage for PGT-A to be undertaken. Moreover, Dr. Fragouli’s work led to the most detailed characterization of chromosome abnormalities in human oocytes published to date. Her research into finding biomarkers of embryo competence, identified several target genes with differential expression in cumulus cells surrounding aneuploid oocytes, and the possible role of mitochondrial DNA copy number as a predictor of embryo implantation potential. Dr. Fragouli has published more than 150 peer-reviewed papers, abstracts, and book chapters. She has been the recipient of multiple awards for her work, including the New England Fertility Society-PCRS Exchange Prize for best submitted abstract (2007) awarded for the work on CGH analysis of trophectoderm samples biopsied from blastocyst stage embryos, the ESHRE Basic Science Prize (2011) for her work on the transcriptome of cumulus cells, and the ASRM SART (2015) Prize for her work on the assessment of the mitochondrial genome of human embryos. She is also a frequently invited speaker to national and international conferences. Dr. Fragouli feels strongly about the need to improve the accuracy and efficacy of PGD. In that respect she has wide experience on the preparation and implementation of a Quality Management System complying with International accreditation Standards (ISO). She has also participated in committees responsible for the preparation of external quality assessment schemes (EQAs) relative to PGD and PGT-A. Dr. Fragouli is an active member of the European Society for Human Reproduction and Embryology (ESHRE), a Fellow of the Royal Biology Society, and a Fellow of the Institute of Biomedical Sciences. Dr. Fragouli has a strong commitment to teaching and the sharing of scientific knowledge. Towards this end she is currently a member of the Editorial Board of various scientific journals, including Human Reproduction, Reproductive Biomedicine Online, and the Journal of Assisted Reproduction and Genetics. She is also serving as reviewer for the abovementioned journals, as well as others such as Molecular Human Reproduction, Fertility and Sterility, and Human Genetics. Dr. Fragouli continues to be an enthusiastic teacher and supervisor of postgraduate students at the University of Oxford. Her current research program focuses primarily on achieving a better understanding of the genesis of chromosome abnormalities in human gametes, the design and application of novel biomarkers to improve IVF outcomes, as well as the identification of patient characteristic traits that could affect fertility and infertility.